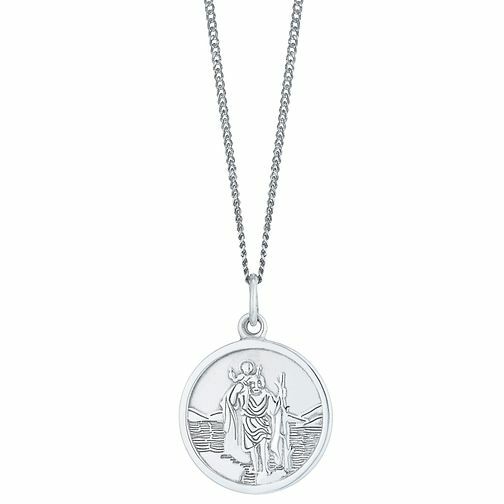 This dainty round St Christopher is crafted in silver and comes complete with a 41cm curb chain. St Christopher is the patron saint of travellers. Silver St Christopher is rated 4.5 out of 5 by 10. Rated 5 out of 5 by Anonymous from Very happy with purchase My 13 year old son was very happy with this St Christpher; it's an ideal size for him and is also good quality. Delivery was also very quick; thanks very much! Rated 4 out of 5 by Anonymous from Good Value for Money Nice size for a child. Good value for money. Come's with a box but my only criticism was chain and charm came in a plastic bag and and one of them ( purchased 2) the chain was knotted .